The list itself seems fairly straight forward, but as one can imagine, it's much harder than it looks. I tested the above theory and localized it to my home office. I know this is against Kondō's teaching and that one should commit to an entire home, but I also believe in achievable goals. I was excited at the get go and followed steps 2-5 flawlessly. Where I failed was the commitment. My office was tidy in two days of uninterrupted cleaning. Three days later, we hosted a house party for my 4 year old's birthday. Young Jedis filled our home and that was the end of my tidying journey... I went back to my old habits of dumping my purse and other items on the floor and my desk was once again covered papers and electronics. Sad to say that this cleaning journey was not as successful as the one I began in January which was to keep my drawers tidy. But, I'll keep pushing on and continue the effort struggle. The Life-Changing Magic provides general tips on how to create and maintain a tidy home. There is a strong emphasis on clothes. How purge, fold and place them. The book also includes many anecdotes on Marie Kondō's past and how she became the tidiness pro that she is today. It sparks a light in the reader to start their tidying journey. The one thing I found that was missing were pictures. Thankfully, Spark Joy includes them. 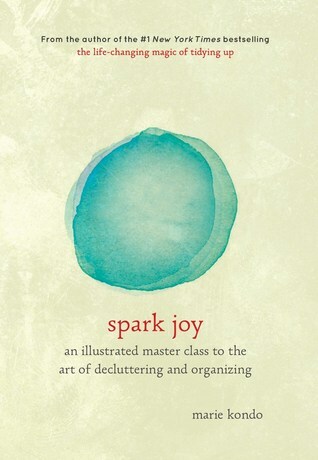 Spark Joy gets into the nitty gritty of cleaning up. It includes step by step photos on how to fold all types of clothing and how to properly place them in their respective drawers. There's also a strong focus on komono (miscellaneous items). Everyone has a variety of knick knacks around their home and Marie Kondō provides some insight and tips on how to manage them. Overall both books follow the same underlying principles. Don't be afraid to discard your things and most of all, keep the ones that spark joy. Have you attempted any of Marie Kondō's tidying methods? Which ones work best for you? Let me know in the comments. I received a finished copy of Spark Joy from Penguin RandomHouse Canada. My opinions are my own.